Since 1932, Triskelion, a TNO company and leading contract research organization (CRO) in The Netherlands, has been helping customers worldwide develop products that improve the well-being and health of consumers, animals, and patients. With such important outcomes at stake, Triskelion supports its customers by constantly improving its expertise in chemical analysis, kinetics and metabolism, immunology, toxicology, and risk assessment. While the company’s three key industries – chemistry, food and feed, and pharmaceutical – represent a similar share of business, Triskelion has developed specialized analytical testing in pharmaceutical and food. Their expertise includes analytical offerings that include a complete portfolio of in vitro and in vivo services for ADME, DMPK testing, and bioanalysis of small molecules and biopharmaceuticals. In order to provide so many complex, crucial and time-sensitive services, Triskelion operates from a deliberately designed infrastructure matching employee skill sets and the right technologies, all aligned to increase efficiency, productivity, and quality. At the center of this are their customers. In order to accomplish this, Triskelion works with a wide variety of specifically chosen technologies from molecular, DNA-based to analytical instrumentation (GC, LC-MS, IC-MS, ICP-MS), and “hybrid” combinations of these technologies, as appropriate. Triskelion’s analytical expertise is so strong that it confidently offers a unique, 24/7 emergency response service to pharmaceutical and food manufacturers. These customers rely on Triskelion to quickly establish the origin, cause, and potential consequences of an incident, such as an adulterated pharmaceutical, or a batch contamination from the cooling fluid in the manufacturing process. The company’s extensive expertise in toxicology, risk assessment, and microbiology helps its customers avoid disastrous outcomes, like a shipment being blocked from entering China due to contamination of an API. Triskelion delivers these critical services by utilizing a wide range of analytical techniques, including electron microscopy and LC-MS.
Today, all companies that rely on analytical chemistry for the successful operation of their businesses face a huge challenge: technology constantly improves and becomes more sophisticated, yet the skilled workforce needed to run these instruments is shrinking. Triskelion also understands that in order to retain the best, they must continually invest in the technical and instrument training of their scientists. With the ability to analyze a wide range of molecules, Triskelion requires and utilizes a variety of technology and analytical techniques. Several years ago they migrated from HPLC to UPLC. This enabled their scientists to shorten method development time, significantly reduce solvent cost, and optimize asset utilization. In addition, they maintain a diversity of mass spectrometers, which run thousands of samples per month. Most recently, they acquired Waters’ Vion IMS QTof Mass Spectrometer with ion mobility capabilities. “Vion allows us to see and apply a new dimension of separation, which also improves our analysis of large intact molecules with a different technique. 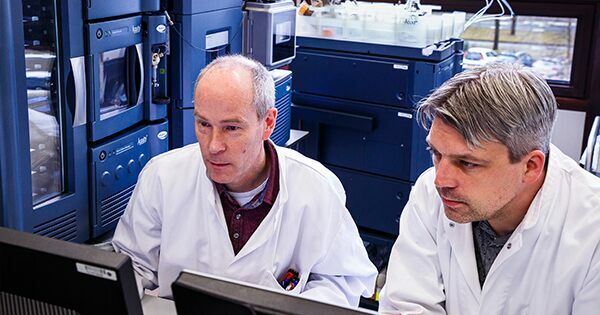 “We appreciate HDMSE because this data-independent MS-MS feature helps us in metabolite identification (Met ID) experiments by providing precise selectivity and routine measurement of every detected ion through clean spectral separation and confident structural assignment of the fragment to the parent ion,” said Kleinnijenhuis. With the continued expansion of the biopharmaceutical market, customers continually look to benefit from Triskelion’s long time experience in analyzing larger molecules. Technologies that allow them to reach lower levels of detection (LOD) and quantification (LOQ) are imperative in this space. 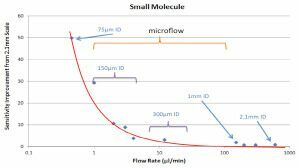 To help their customers, Triskelion uses traditional tandem quadrupole MS coupled with microflow LC flow rate ranging from 1 to 100 μL/min and columns with an internal diameter (I.D.) between 0.1 and 1.0 mm. Benefits are increased sampling efficiency, chromatographic resolution and ionization efficiency, which is especially relevant for larger molecules like peptide and protein therapeutics. An additional advantage with a small I.D. column is that the LC systems require a lower fluidic flow to perform a chromatographic separation, which results in less solvent consumption and lower injection volume requirements (Figure 1). Small sample volume requirements are critical for studies with limited sample. Typically we load 10 μL biological sample in a hybrid assay. Consequently, LC-MS becomes a meaner, leaner, and greener instrumental technique. Most importantly, this scaled-down approach provides sensitivity gains over its high flow rate counterparts. Figure 1. 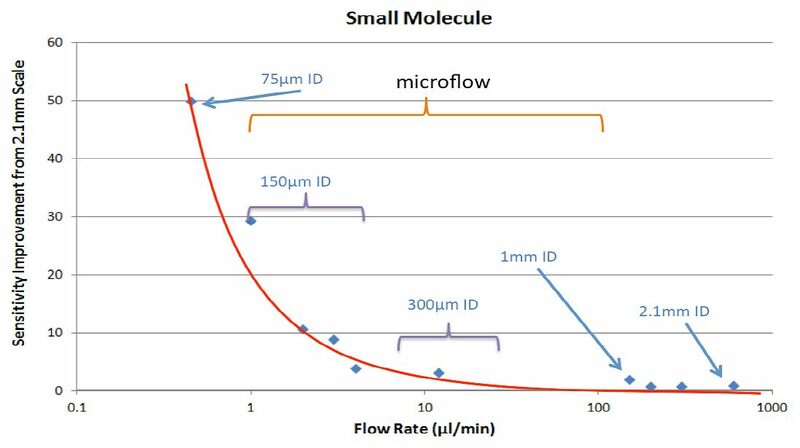 The sensitivity improvements of the LC/MS as the flow rate and the inner diameter of the column reduced from a 2.1 mm to microscale and nanoscale. Triskelion also uses Waters’ ionKey/MS System, which simplifies hyphenation of microflow UPLC with mass spectrometry and provides a level of reproducibility and standardization not seen with traditional microflow LC-MS. By modifying the sample preparation and utilizing microflow LC-MS, they achieved a significantly lower LOQ for infliximab compared with a previously developed UPLC–MS method.³ Prior to ionKey/MS, they tried traditional nanoflow LC but found it lacked the robustness required for their quantitative bioanalytical applications. Issues with carryover, and relatively long retention and run times limited its usefulness. 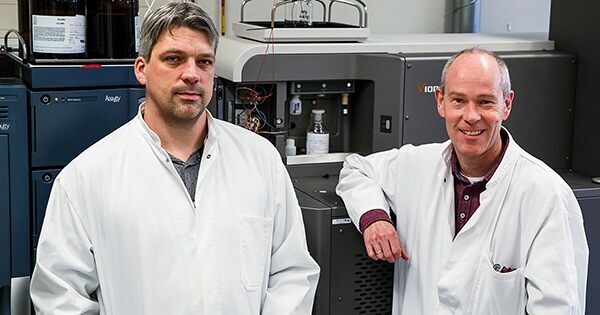 Vion’s ion mobility capabilities, coupled with the UNIFI Scientific Information System, also helped them clean up the spectra and improve the separation of analogous peptides differing by only one or a few residues, which they often encounter in their extensive portfolio of collagen LC-MS analyses. There are a number of trends and industry changes that Triskelion is watching closely. Bioanalysis continues to become more challenging as biotherapeutics become more potent and complex, and with that, the demand for increasing levels of sensitivity and orthogonal technologies. Increased automation to enhance efficiencies in cost and productivity are ever-present as the industry continually pushes speed-to-market. Finally, both Bas and Kleinnijenhuis anticipate greater demand from customers to deliver even higher levels of service and support. Triskelion has pushed its analytical services to the forefront of new and improved methods. This specialized center of excellence plays a critical role in helping pharmaceutical customers develop safe and effective drugs by providing support for bioavailability and ADME-PK from drug discovery to preclinical and clinical development. They are especially strong in method development and the validation of PK assays that enable metabolite identification and quantification. The center also offers ingredient profiling, QA/QC and safety testing of food and feed. What’s more, their in vitro and in vivo models allow them to generate science-based evidence on the efficacy of food and food ingredients in humans. As Triskelion continues to push itself to provide the best services for its customers, the end result may benefit all of us. Kleinnijenhuis AJ. Strategies for bioanalysis of proteins using LC-MS.
Kleinnijenhuis AJ. Exploring LC-MS peptide dynamic range. Kleinnijenhuis AJ, Ingola M, Toersche JH, van Holthoon FL, van Dongen WD. Quantitative bottom up analysis of Infliximab in serum using protein A purification and integrated μLC-electrospray chip IonKey MS-MS technology (open access pdf). Bioanalysis 2016; 8, 891-904.